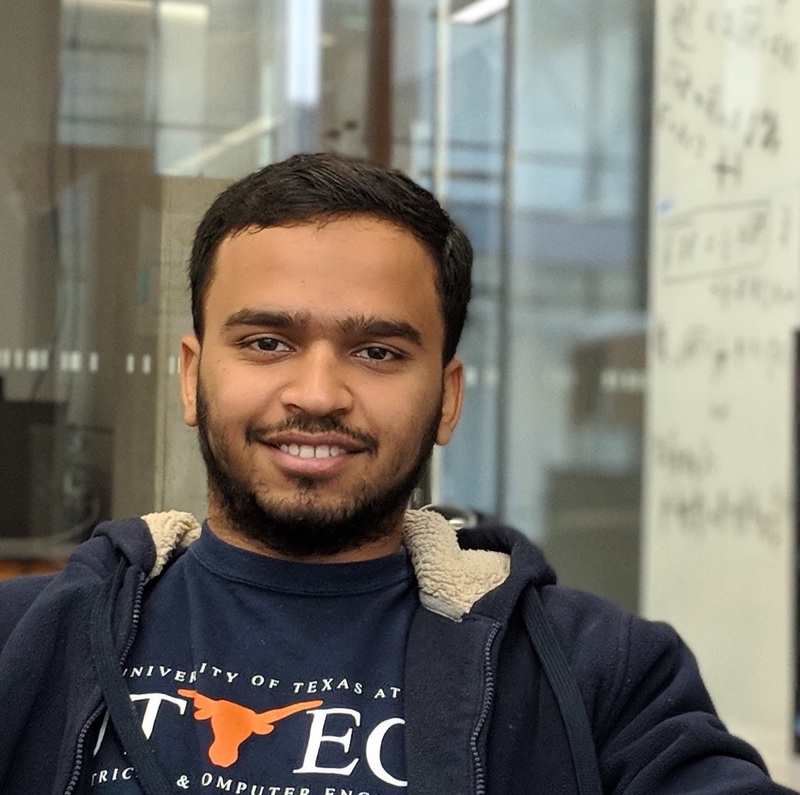 I am Kartik Patel, graduate student in Wireless Systems Innovation Laboratory at University of Texas at Austin. I completed B. Tech. in Electronics and Communication Engineering from Indian Institute of Technology Roorkee. My research interests lie in the field of wireless communications, signal processing, wireless networks and information theory. In general, I like to understand and explain fundamentals of mathematics and communication intuitively. I gave talks on intuitive understanding of Fourier Series and Transforms and Information Theory at IIT Roorkee. I am proficient in programming in Python, C++ and Java. I have developed simulator for Bluetooth Low Energy in NS3. I have also worked on development of a web based display for GNU Radio as a part of Google Summer of Code 2017. Y. Zhang, K. Patel, S. Shakkottai and R. W. Heath, "Side-information-aided non-coherent Beam Alignment Design and Prototyping for Millimeter Wave Systems," in preparation. Developed a mathematical model to analyse Bluetooth Low Energy protocol based sensor networks using Renewal theory. I got oppurtunity to work on Bluetooth Low Energy based sensor networks under guidance of Dr. Neelesh Mehta at Next Generation Wireless Research Lab, Indian Institute of Science, Bangalore. I developed Bluetooth Low Energy module in NS3. Documentation of the module is available here. I worked with Dr. Dhaval Patel at School of Engineering and Applied Sciences, Ahmedabad University. We proposed a novel spectrum sensing technique for Full Duplex Radio. The project is part of Google Summer of Code 2017. I developed a web-based interface for displaying the plots and widgets. The development updates of the project is available here. The project was focused on development of Communication System Toolbox in Scilab. I developed various functions of equalizers for the same. Implemented a processor capable to run 7 basic instructions. Added python script to convert assembly code to ModelSim Simulation script to provide a programming like interface to simulate the project. As a member of Information Management Group, I developed and maintained the Institute Placement Portal. The portal is developed using Python/Django framework for backend and JQuery/Bootstrap frameworks for frontend. The portal includes Admin interface for Placement office, the student side interface, contact manager (to keep track of contacts of companies by placement office) and other features. Initiated a Sixth Sense Lecture Series to explain fundamental concepts like Information Theory, Transforms and Linear Algebra in intuitive manner. Reponsible for all aspects of the backend stack including performance management and security.